DUMBARTON operated a Santa-like free gift scheme when they visited Raith Rovers at stormy and wet Starks Park — and it cost them three points. Some 1,352 fans sheltering from the strong wind and rain saw an absorbing struggle when Sons had the better of, but failed to win. Playing against the gale in the first half the visitors showed quality and commitment, creating good chances for Bryan Prunty, Colin Nish, Aaron Barry and Mark Gilhaney, but none of them were taken. At the other end Raith caused few problems for keeper Jamie Ewings. After the break Sons started to dominate, but then Raith broke away through an exposed defence, and Lewis Vaughan tapped in a Callum Booth cross. A few minutes later much the same thing happened, except this time it was four attackers against one, and Jason Thomson made it 2-0 in front of the home support. In the dying moments Sons sub Steve McDougall pulled one back, but a frantic finish ended with no further scoring. In an action-packed encounter Raith no.7 Joe Cardle received a straight red card for a dreadful two footed challenge on Gilhaney, Jordan Kirkpatrick and Raith's Grant McLaren both had to be stretchered off, Sons finished with ten men when Chris Turner hobbled off after they had used their last sub, and the visitors had five penalty claims turned down — at least two of which looked stonewall. 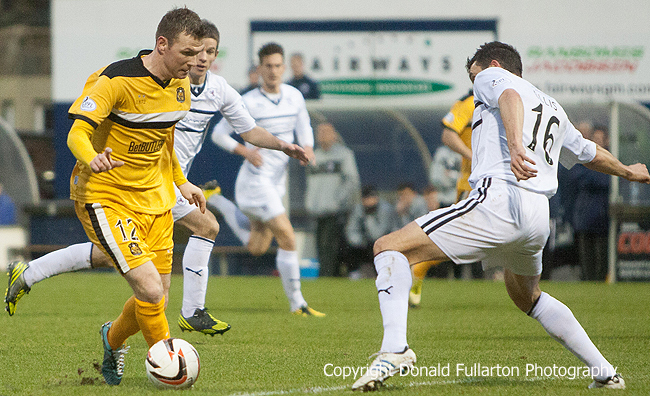 The picture shows Bryan Prunty preparing to shoot.